The Proporta Soft Feel Silicon Case is a black case that is coloured on the inside and on various details, such as around the camera lens. The colour combos are a choice of mainly black with grey, pink or green. There are cutouts at the bottom for the dock connector, speaker and mic. There’s a cutout on the side for the ringer switch, and raised silicon buttons cover the volume control. There’s another cutout at the top for the headphone jack, and a cover for the hold button. The camera lens also has a cutout, and there are two small holes on the back, presumably for heat dissipation. There’s no front covering, leaving the home button entirely unencumbered. It’s ridged on the sides and back, with some of the case featuring a crocodile-skin effect. I have to say, it’s a step up from my old case. It obviously has had some thought put into it, and feels well designed. The silicon itself feels quick thick, but not so much that it’s bulky in your pocket. I thought the covered volume buttons would be annoying, but it actually makes it easier when fiddling with the volume in your pocket. It’s incredibly tactile. I’ve never dropped my iPhone using this case. After a few weeks of use, I noticed wearing around the edges. The black silicon wore away slightly, revealing the white underneath. I wasn’t expecting that from a quality case. I contacted Proporta, who said they hadn’t come across this before, and they sent me a replacement case. This would be a worry, if not for their “Never Argue” returns policy and lifetime guarantee for their products. If it doesn’t do what it says on the tin, you can get a new one. You and I both know that cases can get quite grotty. This case has an “antimicrobial coating guards against germs and bacteria.” I’m not sure if that would convince me to buy it. This one is fresh out of the box, but as you can see from the photos, it picks up dust quite easily. Saying that, it picks up less dust than my previous silicon case. The package includes a screen protector. Considering that I paid £9.99 for a screen protector from Carphone Warehouse, I think in comparison this makes it a pretty good deal (although I later picked up 10 screen protectors – exactly the same – from eBay for 99p). Like other Proporta stuff I’ve bought for my family, it feels well designed. I haven’t heard any problems from them with discolouration of their iPhone and iPod cases. Overall, it’s a nice case, and I’d recommend it. 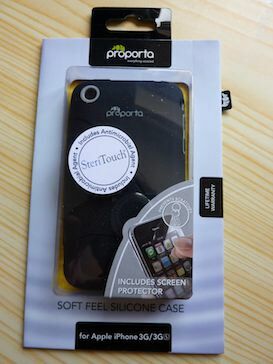 Thanks to Hannah at Proporta for the providing the case for review.